Having been a governor for over 10 years and experiencing the problems and wastage involved in a paper-based governance system I decided to do something about it. 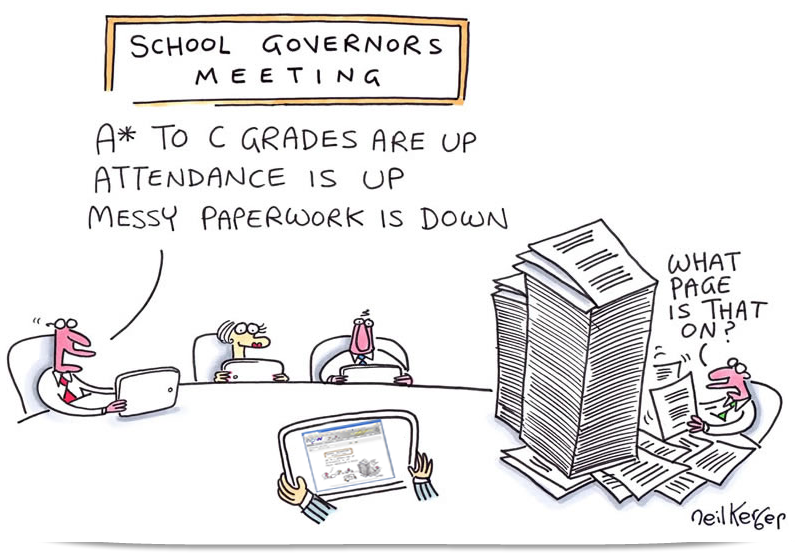 Neils' cartoon illustrates exactly where we were and where we are now, with our Trust making significant savings in both paper reduction and time spent by staff in servicing the governance process. In order to make the system work our governors had to change their mind set from one of having everything done for them by the clerk, to one of becoming pro-active in supporting the school and making sure that we were doing all the things that needed to be done to ensure that we were an effective, informed group who had carried out their duties as governors. I hope you too can get the most out of TTG.